This is another look I created by using nail art products from Born Pretty Store. 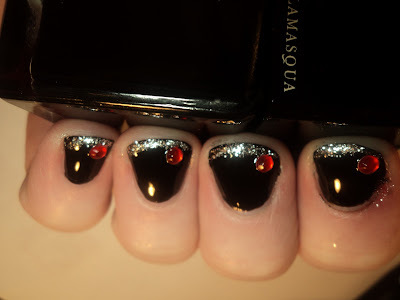 I created this by using Illamasqua Boosh (which is fab, BTW) as the base, a silver glitter striper for the tip and a red rhinestone for the accent. I applied 2 coats of Boosh and a quick dry TC. I then applied the tip. I applied another coat of TC, making sure I had the rhinestone ready to apply. I let the rhinestones set into the TC, and applied another coat of TC after it was almost dry. I think this look, or any variant there-of, would look amazing for the holidays. Remember, all this week, I am showing you nail art looks you can acheive with Born Pretty products. If you have any ideas, please let me know. Nail art pen and rhinestones were sent to me for review. Illamasqua Boosh was purchased by me. Oh, that looks so chic! Indeed perfect for the holidays! That is a lovely twist on a French. Chic! I agree, perfect for the holidays! I love the red!